Get cash for your junk car in Wyoming today! You'll be paid right on the spot by one of our awesome Wyoming junk car buyers. Did you know junk cars in Wyoming outnumber residents two to one? Okay, you caught me, I might not have fact checked that one. However, as the least populous and second least densely populated state in the country, it could totally be true. Since Wyoming is so sparsely populated you run into additional complications when trying to get cash for cars in Wyoming. Unless you’re in Cheyenne or Casper you might often need to drive for over an hour to find a junkyard that will offer you a reasonable cash offer for your car. The thought of that might make you want to push your junk car in the Bighorn River, or just leave it out in the Red Desert. We have a better solution: sell your junk car to The Clunker Junker. We’ll send our premier Wyoming junk car buyers to pick up the car from your home often the very next day after you accept our offer. Doesn’t that sound better than needing to drive for an hour there and back to listen to a joke of an offer? Even if your junk car looks like it went head to head with the famous bucking bronco on your Wyoming license plate we will pay you in cash for your junk car. Finding a reputable junk car buyer in Wyoming doesn’t have to be as difficult as searching for evidence of the mythical Jackalope. Thousands of people have used our cash for cars in Wyoming program with great results. Plus we’re reliable. I’m talking an Old Faithful level of reliability here. Not only will you likely get an instant offer after you tell us about your junk car, but you’re likely to have that car gone and money in your pocket in just days! For cars that are either rusted out or hardly used, we’ll pay top dollar for junk cars. We buy junk cars for cash in Wyoming and will pick it up from your house or place of work. Sounds simple, right? That’s because it is, and you’ll never even need to leave the comfort of your couch to get paid! We’re one of the more prolific Wyoming junk car buyers, and we’ll buy any make, model or condition of the vehicle as long is the vehicle has all its parts and pieces. To start the process of selling your car, you’ll need to fill out our quote form which will give you a precise figure for your car instantaneously so that you can get paid cash for junk cars in Wyoming. What’s not to love? With all the information provided, the website will generate an instant quote in most cases. Once you’ve seen our generous offer and agreed to it, we’ll send our team to pick up the car. Just let us know when and where to pick it up, and our junk car buyers will work with you to arrange a time. There’s no hassle to worry about. Once a sale has been agreed to, we come take care of the junk car removal process and get it out of sight for you. Of course, our buyer will hand over cash for check right then and there. You don’t need to lift a finger! How much can you sell a junk car for in Wyoming? You’ll be shocked at how much you could get paid for your car, even if it has no title or is in a terrible condition. Stop wondering and fill in our quote form right now to get an instant offer for your vehicle. But before you do, you’ll want to consider what group your car fits into so you know what to expect. A huge percentage of the cars that we purchase don’t even start, and of that percentage, some might not even have a motor! For vehicles in a horrible condition, covered in rust and far past repair, we’ll offer you between $25 and $110 depending on the make and model of the car. At The Clunker Junker, we buy junk cars and used cars, but we’re also keen to buy cars in-between these two groups. These middle-ground vehicles are often not junk, but they may not be working currently. They still have usable parts that can be re-sold. Despite what you might assume from our name, it’s not only clunkers and junkers that we purchase. We’re also in the market for used cars, whether they are missing windows or only slightly used. Depending on the condition of your vehicle we could pay you up to $10,000 for the car. Required: The state of Wyoming requires that all titles are signed in front of a notary public! We have put together a simple guide and example for how to sign your Wyoming title when you are selling your vehicle. If there are multiple owners listed on the title, they must all sign the title unless the names are separated with "OR". On the back of your Wyoming title, skip over the purchaser section towards the top. That is for the buyer to use, not the seller. Instead focus on the section where it says "All owners whose name appears on the face must sign in the presence of a notary public". 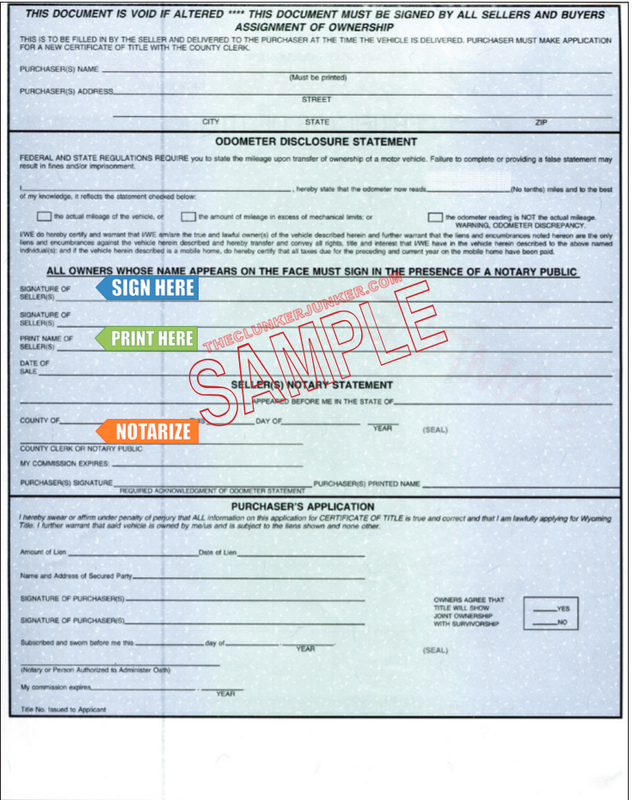 Print (don't sign) your name on the back of the title where it reads "Print Name of Seller(s)". 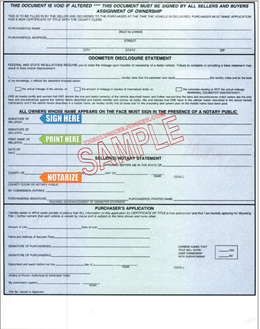 Be sure the notary signs and stamps the document. Visit your local county treasurer's office and fill out an application for duplicate title. These forms vary from county to county so make sure you use the one where you live. Please note that there may be a waiting period before a duplicate title can be issued and the cost is $9.00. (Paid to the WY department of transportation). Getting rid of an abandoned vehicle in Wyoming can be a difficult process. Unfortunately, you cannot just sell any junk car that ends up on your property if you do not own it. You'll need to follow the Wyoming abandoned vehicle removal procedures. We have given a general overview of what that entails below. To have an abandoned vehicle removed from your private property, you must first submit two postings in a publication of common circulation where the vehicle was abandoned within a (2) two week time frame. The buyer of the abandoned vehicle will be issued a Certificate of Sale to be used in applying for the title. Do you buy vehicles in Wyoming if there is no title? No, sorry! We would love to, but not many of our buyers are currently making offers on vehicles with no title. However, we could help you through the easy process of obtaining a duplicate title if needed, just let us know! Wyoming often changes their title documents from year to year. If you have questions about your specific title, please contact your Wyoming county clerk. Yes, unless you are transferring the plates to a new vehicle. You can return the plates to your local clerk’s office. 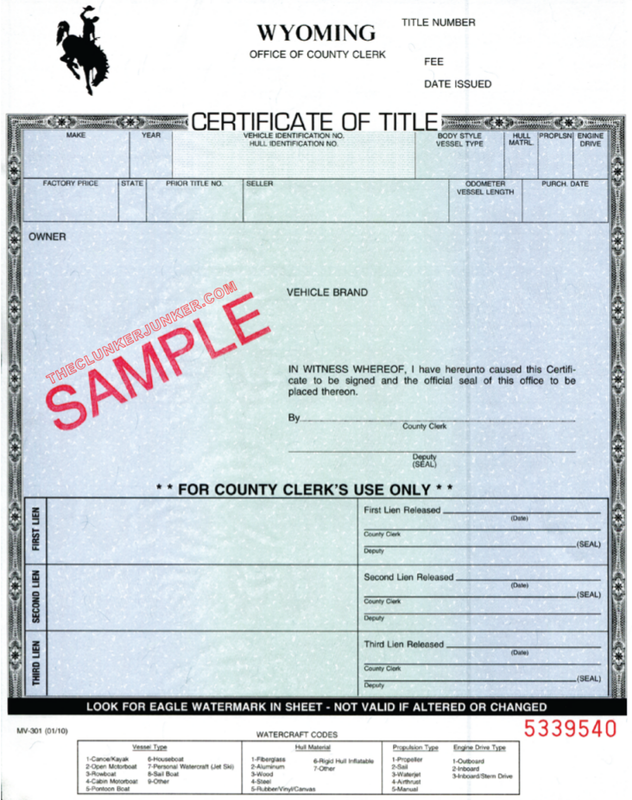 You may need to notify your local county clerk’s office that you have sold the vehicle. You can contact them with any additional questions or concerns about the transfer of your title. "The vehicle hit a tree about a year ago and bent the front bumper back. The only thing wrong with the vehicle is that the ignition is out. It has almost a brand-new supercharger, as it is the Komoressor series." "The vehicle has a dead battery, a flat right front tire and a low left front tire. On the right back quarter panel, there is a piece coming away from the body but no impact damage. " "The vehicle blew a brake line to the rear, it needs front-end work and rear brakes with a right rear shock. It was my daily driver with 220,000 miles on it until the last repair needed. I wish I didn't have to junk it." "I took off the transmission to fix a bad freeze plug. I never finished it. The transmission is in the truck bed. The engine and transmission and everything work fine. It just had a bad freeze plug." "I'm junking the vehicle because it started to smoke, and it leaks transmission fluid. The color on the outside of the vehicle is fading, the interior seats are torn in some places, and it's dirty because my husband works in construction. The radio doesn't work on the inside, and some of the locks are broken." "One of the tires slowly loses air, but it can be filled up, and then all four wheels can work for about four weeks or so before that same wheel (front passenger side) begins to show some loss of pressure. There is also an inflated spare in the trunk. The battery is dead, but it may be able to be jumped. It seemed the starter was starting to go out (sometimes I could not start it). " The Clunker Junker is one of the top junk car buyers in the state of Wyoming. To date we have made instant offers on over 1 thousand vehicles across the state, totaling over $400 Thousand offered! 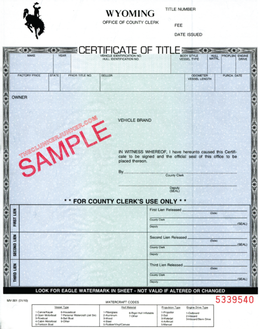 We were not able to purchase many vehicles without a valid title. We also buy cars on a wide spectrum of conditions and 56% of the vehicles we've made offers on in Wyoming do not start or drive. Many also have moderate to severe body damage. Cheyenne in Barton County was our top producer, followed by Casper.